If you don’t know by now, then I’ll gladly say it again. I love Korean food. Any dishes for that matter. Korean cuisine has such robust flavours, colors and are also pretty healthy as they incorporate a lot of vegetables to their diet. My family and I often have Korean, at least once a week. Whether it’s eating outside or homecook, we all love Korean food dearly. We also love a good Korean BBQ. Though I have made Korean BBQ at home before but I prefer to eat out simply because there are plenty Korean BBQ places that are really good out there and we like to leave the messiness to others. One place to enjoy a good Korean BBQ is Hwa Ga Korean Restaurant. With five outlets spread all over the city, Hwa Ga serves a substantial variety of Korean dishes from BBQ to stews and even a very unique Nurunji chicken. We visited their Sunway Mentari outlet one Saturday to check out their latest promotion of All-You-Can-Eat Korean A La Carte BBQ Buffet that just started. Available for lunch and dinner daily, this promotion is a steal for those who enjoy lots of barbeque meats and seafood. That’s not all, it’s a la carte buffet so it means you order of their menu so that everything is kept fresh. Hwa Ga Korean restaurant is designed like most typical Korean restaurants. Simple minimal décor with spacious settings, the Sunway Mentari outlet is bright and lovely. Lots of natural lighting from the glass walls, a lovely counter bar, well-kept ventilation even though it is a BBQ restaurant and even the air-conditioning was solid and cool. We sat down to one of the long tables and was happy with what we saw on the All-You-Can-Eat Korean A La Carte BBQ Buffet menu. Definitely lots of meat from pork, beef and chicken to some squid as well. Besides all the meat and seafood choices (12 choices to be exact), there is also a long list of other dishes from stews to rice, noodles, pajeon, tteokbokki and even Korean fried chicken. Let’s not forget the refillable Banchans too. First up, Banchans all ready and set to go… Kimchi, Spicy Eggplant, Beansprout, Spicy Fish Cake, Crispy Anchovy and Peanut, Sauteed Zucchini, Egg Roll, Spicy Onion and Lettuce Salad. These choices of Banchans may differ daily. Hwa Ga uses special charcoal that has less smoke so fear not for those who are worried for their hair and clothes. The restaurant also has pretty good ventilation system with the underground suction system. Grilled your own meats or if the restaurant is not too busy, they might be able to also help you with the bbq. The Grilled Pork Ribs are simply divine and we ordered 3 rounds of this yummy and tender pork ribs with bits of fat. The savory and sweetness is well-balanced in this one so we really enjoyed this very much as well as the thick Pork Belly. 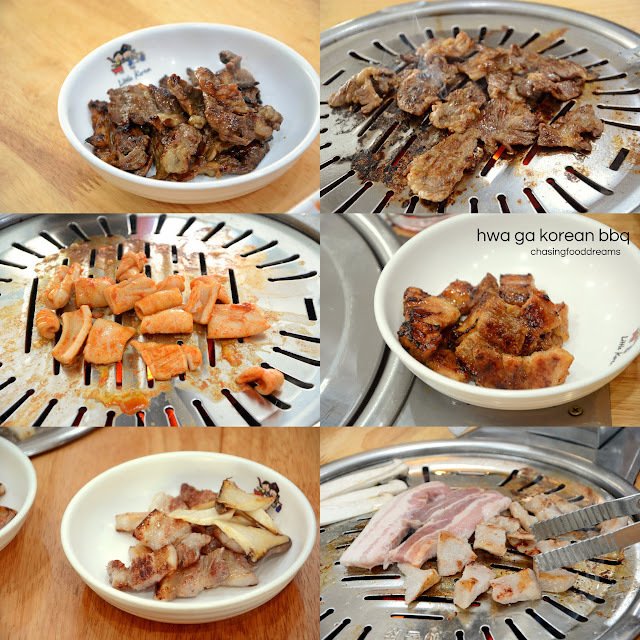 There is also a O am Bulgogi (Spicy Squid & Pork Belly Bulgogi), cooked in the kitchen and served upon order. Korean Fried Chicken! Most Korean BBQ restaurants don’t serve these but I was glad they do here. Although I didn’t expect too much from these, all choices of Yangnyeom Chicken, Fried Chicken, Banban Chicken and Dakgangjung turned out very decent. Crispy, tender, moist and individually seasoned with various sauces and seasoning. Koreans love their stews. Also part of the menu are classic stews of Kimchi Jiigae, Doenjang Jiigae, Woosamgyeop Deonjang Jiigae and Sundubu Jiigae. These are great with rice or even good on its own. There’s also Kimchijeon and Pajeon. Whether you’re opting for spicy kimchi pancake or spring onion pancake, these are no doubts classic favorites when dining in Korean restaurants. Japchae, a healthy myriad concoction of vegetables, chewy noodles and sometimes some protein. It’s a good dish to get more vegetables and give your jaw some exercise with the chewy noodles. For fillers or if you must have your rice, choose from the regular bowl of Bibimbap or the hot stone bowl of Dolsot Bibimbap. Either one, both are healthy and delicious. There’s also fried rice Korean style and Hwa Ga offers Kimchi Bokkeumbab and Yachae Bokkeumbab. One’s spicy with piquant kimchi while the other is vegetarian. While most may not think to order noodles, I am still glad Hwa Ga offers Shin Ramyeon and Kimchi Ramyeon in this buffet deal. My little one had the Shin Ramyeon and enjoyed it very much. The All-You-Can-Eat Korean A La Carte BBQ Buffet is really a value-for-money deal if you enjoy lots of meat and other Korean dishes. · 1 special gift for each table. As mentioned earlier, besides the BBQ, Hwa Ga also serves various renditions of Nurungji Tongdak. Nurungji is actually scorched rice. It is actually the thin crust of the bottom layer of steamed rice. Nurungji Tongdak refers to whole chicken stuffed with rice cooked with other ingredients and roasted in charcoal oven for one and half hours till everything is well cooked together. The chicken is then butterflied in order to press the rice filling to be cooked on a hot plate to scorch the rice. Then the chicken is then paired with various condiments and sauces to be served. Hwa Ga serves 10 variations of Nurungji Tongdak. The rice filling has glutinous rice, black rice, ginseng, jujube dates, gingko nuts, pine nuts, pumpkin seeds, barley and garlic. We savored three variations with the first one being the original Nurungji Tongdak (RM55). The Grilled Chicken with Scorched Rice has a wonderful aroma as the rice filling is being scorched on the hot place. The chicken is tender and makes a lovely contrast with the scorched rice. The dish is best eaten hot for flavours and textures. There is also the spicy Nurungji Cheese Buldak (RM65). This one features Grilled Chicken and Scorched Rice with Cheese and Spicy sauce. Enjoy ooey gooey cheesy sensations as one pulls the chicken smothered in lots of melted cheese and spicy sauce. The Nurungji Modeum (RM75) which features Assorted Grilled Chicken with Scorched Rice has the additions of lots of spring onions, onions, bonito flakes, cheese and sweet corn. Make sure to eat this hot while the cheese is still soft and melty for best flavours. Drinks are Not Included in the All-You-Can-Eat Korean A La Carte BBQ Buffet but fear not, there’s plenty of choices available for additional order. Choose from Soju, Makgeoli, Beer, Plum Wine, Tea, Sodas and Juices. 7, Block K Soho KL. Often times those foods are sold at a far less cost than more nutritious foods are and they are often more convenient to throw together when you need a quick meal. Smorgasbord is generally used to engage visitors and VIPs amid business courses, birthday parties, or corporate occasions. With the end goal to give your visitors a charming smorgasbord, let me share with you a few hints to get ready for a smorgasbord. Visit https://www.pakrush.com/2017/05/dua-and-wazifa-to-sell-property--house-plot-quickly.html this very good website for the more Information. Indeed, it is one of my favorite things to eat.